For years, platform has been a buzz word throughout the publishing community. Every agent and editor is looking for authors who have visibility or a platform in the marketplace. I've written a free ebook on the topic, Platform-Building Ideas for Every Author. One of my key mentors in this process of building an online presence has been Internet Marketing Expert Jimmy D. Brown. Several years ago, it was through Jimmy I learned how to create a membership site like my Write A Book Proposal course. His insights and teaching has been incredible and helped me in many different areas. I continue to learn important lessons from him his information. In the last week, Jimmy started giving away a series of six one-page documents that he calls Cheat Sheets. Each of these documents are packed with information for every author. In this article, I want to call to your attention each one of these resources and explain why author's need to study each Cheat Sheet. I've made these cheat sheets easy to download. Just click the link in each section and it will open to the resource. While there are many different ways to market your books, I believe every author should be building an email list where you are collecting names and emails of people who care about you and your work. Jimmy has created The 1-2-3 List-Building Cheat Sheet which helps you understand the steps and gives specific information about how to do it. Besides selling books, as an author you can create other products to sell to your audience. I've got a series of ebooks and other products that sell all the time such as Blogging for Bucks or the Simple Membership System. I encourage every author to create such products and create their own income stream which is separate from their books and other aspects. You need to get The 24–Hour Product Creation Cheat Sheet and study this information, then take action in your writing life. You may be a blogger or write magazine articles but how do you turn your content into money? The details are in The Content Into Cash Cheat Sheet. Yes the information is in brief but this resource will certainly get the idea wheels turning. Most of us as writers operate alone. How do you find competent people to assist you and get more accomplished and make more income? Study The Hands-Free Outsourcing Cheat Sheet and you will begin learning these details. Many writers are struggling financially yet The Simple Six-Figure Cheat Sheet provides the step-by-step insights for every author to achieve success. This resource gives five different models to reach the six-figure mark. Study this cheat sheet and take action then six-figures becomes do-able. Your website can look fantastic but if you don't learn traffic techniques to get people to see it, that beautiful website is worthless. 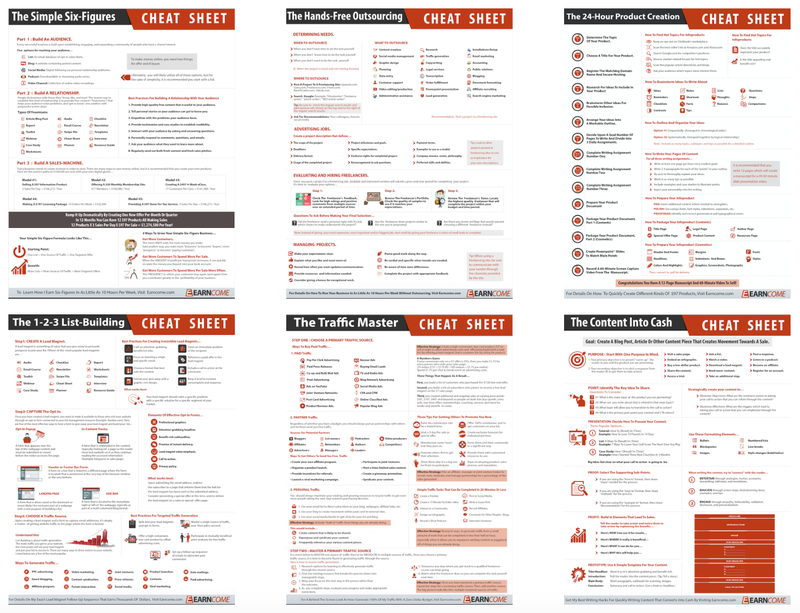 You need The Traffic Master Cheat Sheet. Study the words on this page then apply them to your writing life. 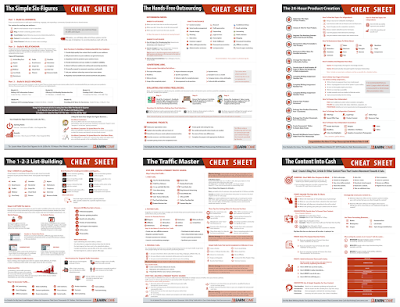 While each of these cheat sheets contain seasoned guidance, there is no easy fix. You need to take daily action to achieve success. These pages contain rich knowledge and make it well worth saving to your hard drive, printing and study. Jimmy D. Brown's newest course is at Earn Income.com. He's a master of marketing and every author can learn valuable insights from his teaching. I know I have learned a lot and continue to learn a lot from him. Let me know what you think of these cheat sheets in the comments. These cheat sheets look fantastic! I look forward to printing them out and reading through them. Thanks so much for sharing this resource :). My website is lydiasherrer.com if you ever want to pop in and see how I've been able to implement them. Thank you for the feedback, Lynn. I agree they are fantastic. Keep up the good work and take action.